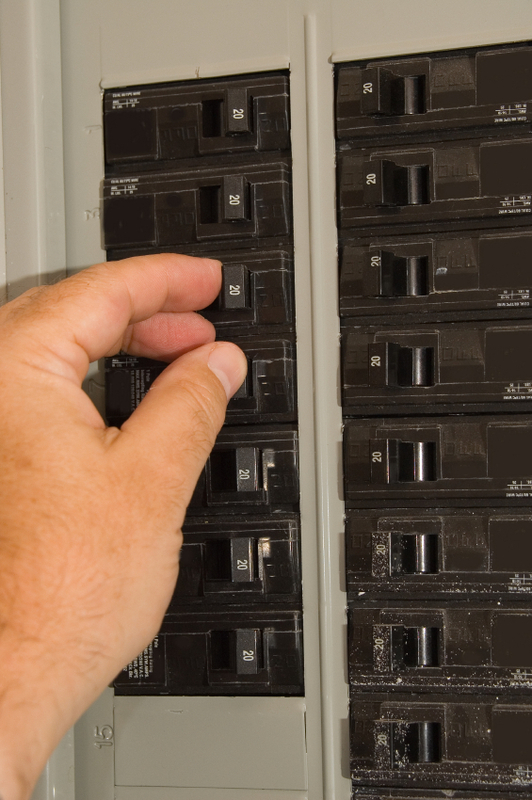 What does it mean when your circuit breaker goes off (trips)? It’s not fun having electrical problems, but before you call an electrician, there may be some steps you can take to fix the problem and save you the unnecessary cost of an electrical repair. One, you may have too many electrical appliances plugged into the electric outlet which can cause overheating or a large power surge. Your breaker is designed as an electrical safety feature to stop power from going to the overheating wall outlet. This means that this safety feature will automatically shut off when you have too much power going to one specific breaker and it will shut your panel breaker off to that circuit. You will have to manually reset the breaker to get power. To reset the breaker, push your breaker to the off position first and then back to the on position. If you are overloading circuits you want to consider having extra receptacles or GFCI protected receptacles added by a certified electrician. Second, it could also be a loose wire which only a certified electrician should help you repair.. You should never attempt to do wiring on your own because it would cause injury to you. Resetting the breaker is ok to do on an occasional basis. For example if you have plugged too much into one circuit and over loaded the circuit. However, if you find you are resetting your breaker several times. You might want to give us a call to take a look. Resetting the breaker too often can cause the breaker to fail and not do its job of protecting you and your home from electrical hazards.